65 downloads and three comments? An irregular MRML series powered by the wild generosity of our reader, Roberto: Enjoy and don't forget to leave our benefactor a thank-you comment. While members of the 3 Mustaphas 3 may have been in the Damned, Magazine and the Amazorblades this band's major connection to punk rock is their love of high-speed tempos. 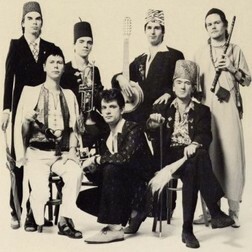 3M3 were kinda like a Balkan version of The Pogues or Gogol Bordello twenty years before the fact. From the Balkans to Your Heart is an out-of-print German-only LP that compiles all the band's BBC Radio One sessions for John Peel and works as a great introduction to the band. 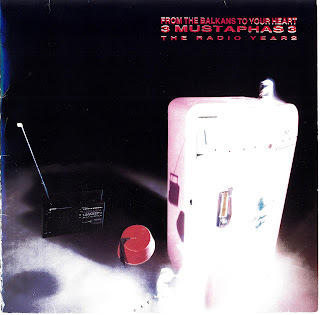 Give us your take on the 3 Mustaphas 3, in the COMMENTS section, where you'll find the From the Balkans to Your Heart). Thanks jeffen... had no idea about this band, and I'm not sure i do now either to be honest - but enjoying it all the same! Sometimes MRML cause understanding, sometimes enjoyment (and sometimes both!) but we're happy with any of those results. Chiding readers kills blogs, too. There's a lot of way to take that comment but none of them very good. I'm looking forward to finding out what I missed the first time around. Thank you! "finding out what I missed the first time around" good call. Jeff, I have no interest in this music per se. But I feel you are letting things get to you. If you succeeded in getting 65 dld's you should consider that a success. The fact that you only got 3 comments is just giving bad feelings free rent in your mind. As an old fart from the sixties I say just let it go... life to important to worry about other peoples bad manners. You may be right, I may be crazy (as Billy Joel once said) but comments are what keep me going, I can't just let it go or I'd let the whole thing go with it. This is the last thing I would have expected on this blog, and love it to death! I love the occasional unexpected move. I don't want to blate, but in all files the phase between L/R is 180 degree shifted, so bass is canceled on subwoofers and acoustically! So there's a technical problem..
Thanx for this.Reminds me of better Times.John Peel ya know. In another style, any chance of uploading some NMA? Hokey smokes this is fantastic! 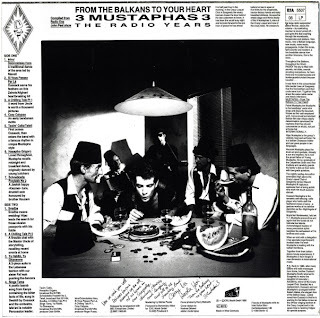 Very Big thank you, I remember listening to the Peel sessions with this band and always felt something was missing from the other albums (stories of Mehmet, anyone remember the footie match versus Plymouth Argyll?). Stoked to find this here and even more to find a download that works. I will take it as such, and if I find any more rare 3M3, perhaps these comments will inspire another post! You can't coat a wolf in chocolate because it already has its own fur. Thanks hugely! I haven't put my ears to any 3M3 in a long while, and I have always loved this band! Wonderful! Sadly the link did not work for me. I was looking forward to hearing those Chilling Tales after so long. Not a great day for inter-species dialogue. is there anyway in heaven or hell that you could re-up this file. it would serve humanity very well. "Something broke in the last federal election."